Fight Resume Lies with a good Background Check! tips that will help you accomplish this. I have also suggested that if looking for a job, you would do well to make sure your resume is “background check ready”. This not only puts you in a good light with a future employer, but makes the entire process much easier. (You can find tips to help you do this here). The simple truth is, people do lie on their resumes. The goal of any good background check is to uncover those lies and allow you to go into the hiring process as informed as possible. 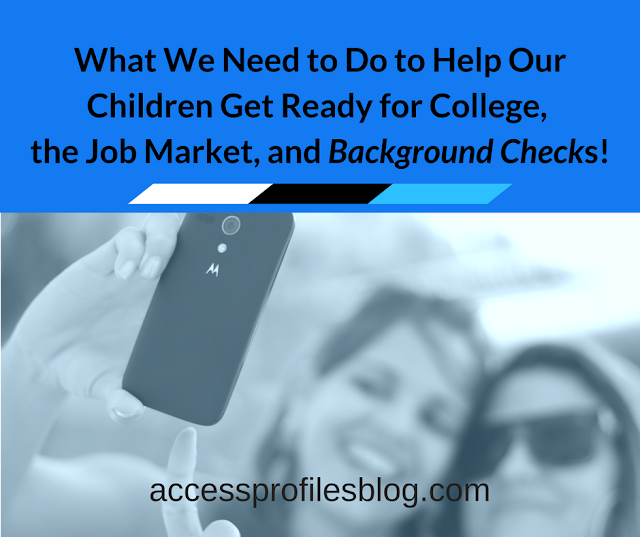 Discover How Background Checks can Help You! Resume Lies Cost Small Business Big Money! "Tweet This"! But while I have mentioned the financial strain that results from making a bad hire before, especially on a small business, this infographic from Cierra Ford via backgroundchecks.org really opened my eyes! spent because of resume lies. Yes that is $600 BILLION! This figure covers the increased time needed to screen resumes. According to Ford’s infographic, 40% of HR professionals say that because of the prevalence of lies, they are now spending more time than ever to verify applicant’s claims. 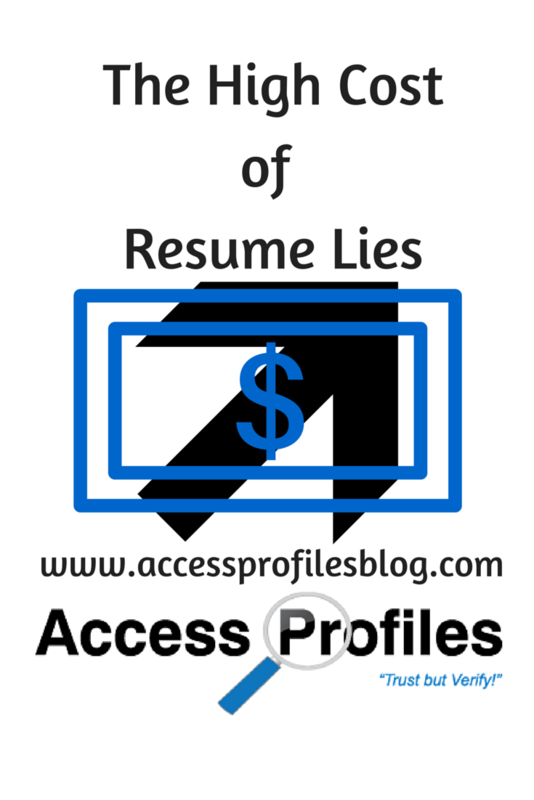 With 53% of resumes and applications containing lies of some kind, it is clear that the cost of resume lies comes high! In addition to the money and time spent on screening, fabricated resumes can also present very real and serious legal issues to employers. If your company hires someone who is not fit for the job, whether that is because they are unqualified or unsafe, it opens you up to negligent hiring lawsuits. It becomes even more serious if someone is harmed due to that hire - whether that is another employee or a customer. While it is possible that you may be able to sue the person who lied, that is not always a slam dunk. You have to prove that their lie harmed your business and that there was no way you could have known they lied before you hired them. Your best defense is a good offense! You need to do all you can to verify resume claims before you make the hire. Take note of any possible “red flags” in an applicant’s resume. Spend the time needed to verify these before you interview, and even question the applicant if you need more clarity. Be sure to verify all academic degrees or skills claimed by the applicant. Do a thorough Background Check. Verify anything left hanging from your initial screening, along with a criminal record check. It is also important that you make the applicant aware (in writing) that resume fraud is grounds for withdrawing any job offer and for firing even after you hire. Be Ready to fire an existing employee for resume fraud. If you uncover that your employee lied, you need to consider the following; if their lie results in them no longer being qualified for their position, if their lie effects your ability to trust them, and if you consider their lie a breach of honesty. Small businesses need to protect their integrity and their brand. It takes time to build trust in the products and services you provide. But very little time to lose it. Hiring anyone who has shown a penchant for lying, does not bode well. Lying to get the job may just be the beginning. Will you be able to trust that they are not lying to your customers, their fellow employees, or you in the future? It is in your best interest to make your position on honesty completely clear. It speaks to your business ethics and is a great foundation for how you expect your company to operate ~ beginning with you and continuing on to your employees. Hiring an employee that is dishonest is a costly mistake, especially for Small Businesses. You and your company deserve more! Please Pay it Forward and Share this on Your Favorite Social Sites! Want to make sure your company is protected from these High Cost Resume Lies? We can Help You Hire Safely! We can help you develop the hiring practices you need for success! Discover more About Us too! Unlike my usual articles, I am going to go on a bit of a rant here. While I have written before on women in business issues; “Women in Business ~ My Case for Why We Need to Help Ourselves” and “The Ability to Choose ~ A Legacy We Leave to Our Daughters” .... This time it is Different. I recently came across an article on Inc.com, “Case Closed: Women Do Make Teams Smarter”, about women in tech, specifically high-tech firms. In this article, the author, Geoffrey James, delves into the subject of women in high-tech companies. James calls these high-tech jobs a male dominated field with, at times, an openly hostile treatment of women applicants and employees. “It turns out that gender bias starts in the selection of candidates to be interviewed. When I read this paragraph, I was incredulous. I was amazed that simply seeing a woman’s name on a resume can result in them being overlooked and ignored for the job ~ even when they are equally, or even more, qualified than a male candidate! Women are good at their jobs. They come to the table with all the education, skills, and abilities to excel. And employers in all sectors would do well to realize this. According to a report by Rochelle Sharpe in Bloomberg Business Week, “As Leaders, Women Rule”, “female managers' strengths have long been undervalued, and their contributions in the workplace have gone largely unnoticed and unrewarded. Companies are now saying they want the skills women typically bring to the job, but such rhetoric doesn't always translate into reality”. Employers, managers, and supervisors often pass over women for promotions due to their bias about their abilities. The belief that their traditional “female” traits makes them less qualified clouds their judgment. We all would like to believe we are beyond this, but clearly that is not the case. Bottom line, we need to start at the beginning. 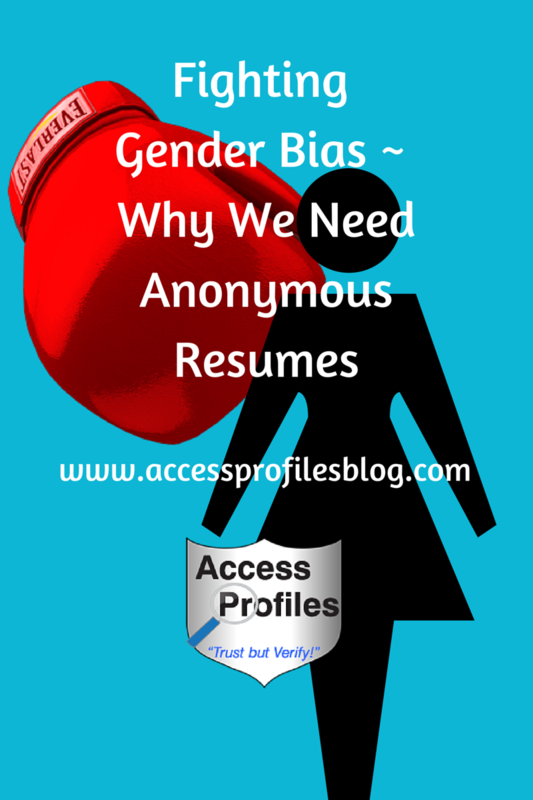 We need to fight bias during the hiring process. This is where I found Geoffrey James’ article most fascinating. In it he proposes an interesting solution ~ removing names from all resumes! James advocates stripping “candidates' names off their resumes before you select which candidates to interview”. He even goes as far as suggesting that the selection process be followed by remote interviews; “with the candidate represented as a neutral-gender avatar mirroring the candidate's facial expressions. Morph the candidate's voice so that it's gender neutral”. James believes that this will result in a more even playing field. While he is specifically addressing the world of high-tech, I think this could cross over to any field. I would love you to share this and leave a comment. Thanks! 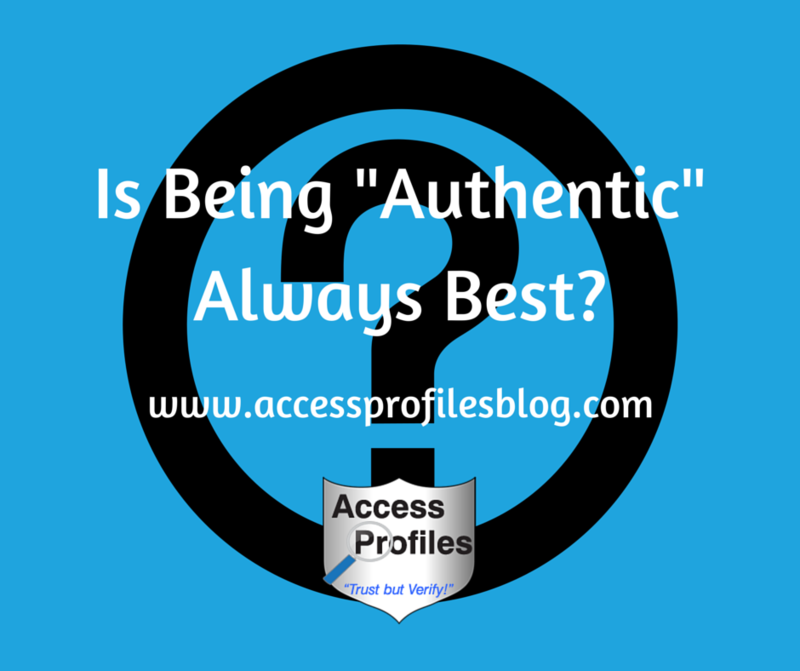 Is Being “Authentic” Always Best? Synonyms include; bona fide, genuine, honest & true. A lot has been written lately about the importance of being authentic - in person, online, and in your business. While I am all for projecting “you” into all you do, I think that instead of saying we need to be authentic, we should instead focus on being our Best Selves. This means putting the very best of what we can offer out there for all to see. This goes beyond just showing the “real” you. It means taking what is good about ourselves and our values and promoting them to the fullest extent. That does not mean we shouldn’t be honest about our short comings or our failures ~ that is what makes us human. And sharing these helps bond us with others. Face it, we have all floundered. Failing and making mistakes goes hand in hand with reaching forward and attempting things we have not tried before. It also means trying better next time and being willing to change what does not make us happy. Sharing this side of ourselves is good. But what if your “authentic” self includes bad behavior? What if it is “in your nature” to be condescending, judgmental, or unkind (even if it is only sometimes)? Putting our best selves “out there” should mean that any petty, unkind, or derogatory thoughts about others be kept inside. Often times these are fleeting and temporary (at least hopefully!). Sharing those in person can be hurtful and sharing them online makes them permanent. Being “authentic” should not include being mean or destructive ~ and I have found a lot of this going on lately, especially online. The “trolls” that simply leave comments to stir controversy are the worst. They hide under the guise of “being themselves” and under the label of practicing “free speech”. They are nothing more than online bullies! This is not being “authentic”. What being Authentic should mean is that you are true and honest about YOU. It should not mean being hurtful towards others and trying to explain it away by saying that you were “just being honest”. When I write my blog, it is always with My Voice. I share my opinions on topics that I believe will help you and your small business, or even discuss those that I think won’t. I strive to keep my core values and my “why” squarely in mind. Doing this gives me greater focus and drive. (You can find out more about this in my article; “I Know Why I do What I do”). I believe this helps my readers and clients relate to me far better than if I was less honest and forthcoming. The same goes for any comments I make on the posts of others. I may disagree with the writer (and expressing that is healthy), but I will always respect their view. I am not in attack mode. It promotes understanding, accepting, and, most of all, loving yourself. But none of us live in a vacuum. What we say and do effects others. 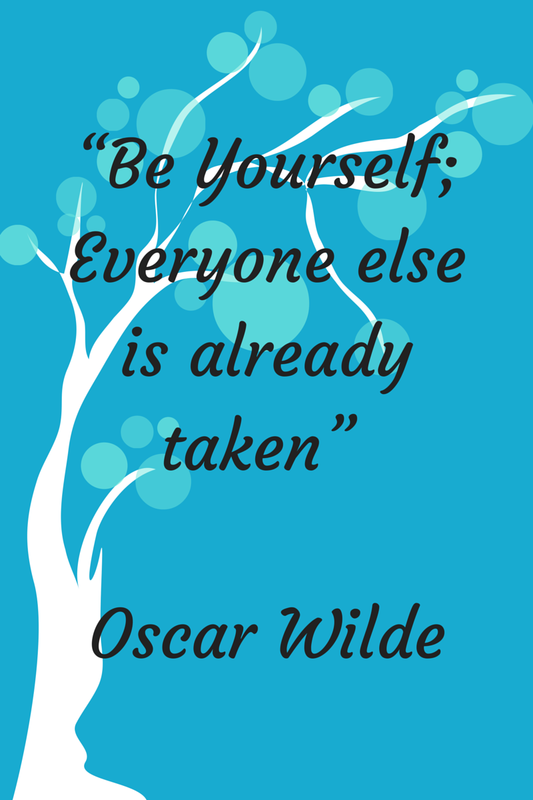 And we should not forget that under the guise of being ourselves. others the freedom to feel the same. When being Authentic means you know and understand yourself - all your strengths, weaknesses, and what makes you unique - then you have won. But, when it means you feel free to hurt others in the process, then I think it is an Epic Fail! I write about issues that effect small business owners. 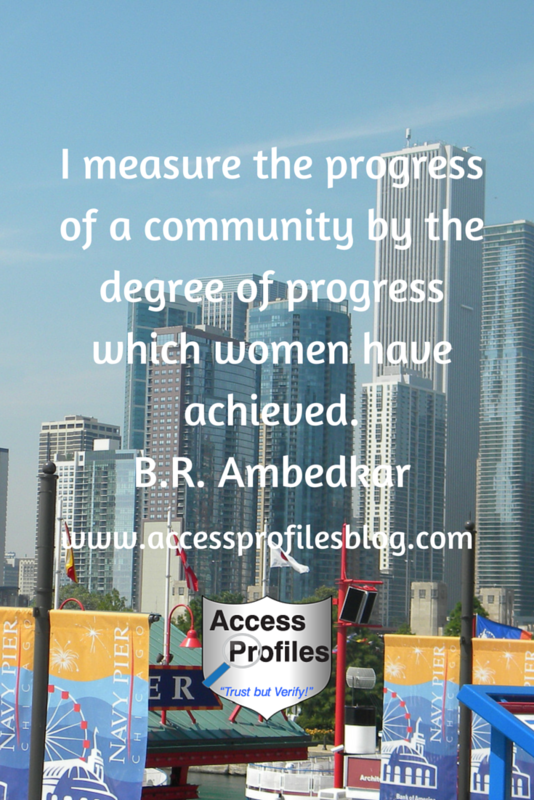 Look for tips and news that can help you in my blog, www.accessprofilesblog.com. Subscribe and you will get one new article every week, and no Spam! 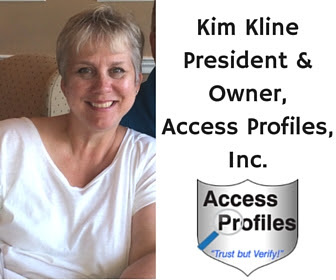 I would also love to connect with you on LinkedIn, Facebook, Twitter, and Pinterest! 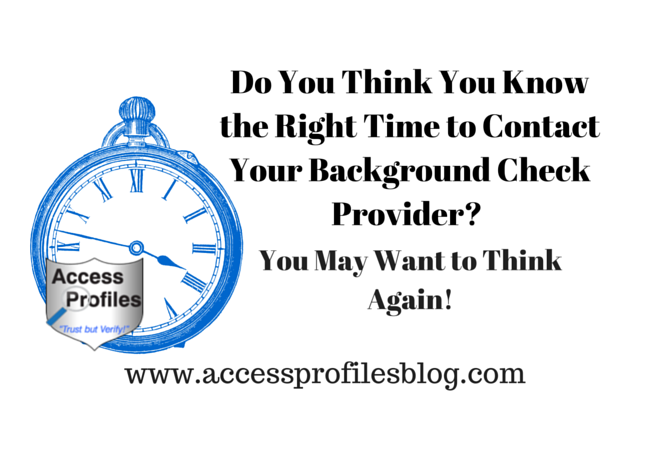 Do You Think You Know the Right Time to Contact Your Background Check Provider? You Might Want to Think Again! You are ready to make a new hire for your Small Business. You tell your contacts, place ads ~ all the things you hope will land you the perfect applicant. You contact a few hopefuls to come in for an interview and find 3 possible candidates. Before making an offer, you decide it might be wise to run a background check. You make a few calls, or check online, and find a company you think will get you the information you need. Instead, this is a perfect example of putting the cart before the horse. My advice? 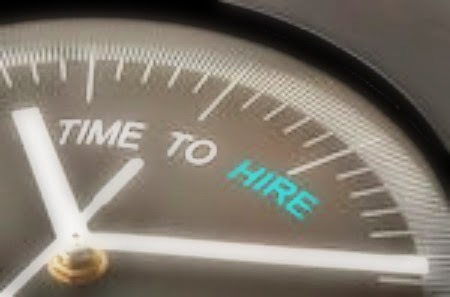 The best time to contact me is BEFORE you ever need to hire! Many companies get this backwards. They realize they need to hire, then scramble to find someone to help them screen their applicants ~ or worse, forgo the background check all together. Meeting with potential background check companies before hand, and choosing the one best for you, will make your hiring process much smoother and more successful! A good background check company will help you put in place all the steps you need to follow well in advance. This may start with the job descriptions for each position within your company (this is something that I have helped clients with in the past), and should also include advising you on your employment applications. They will also make sure your release forms are compliant (or supply you with one of their own), along with giving you copies of employee rights forms, adverse action letters, etc. Connecting with your background check company early also gives you ample time to ask any questions you may have about the employment screening process. 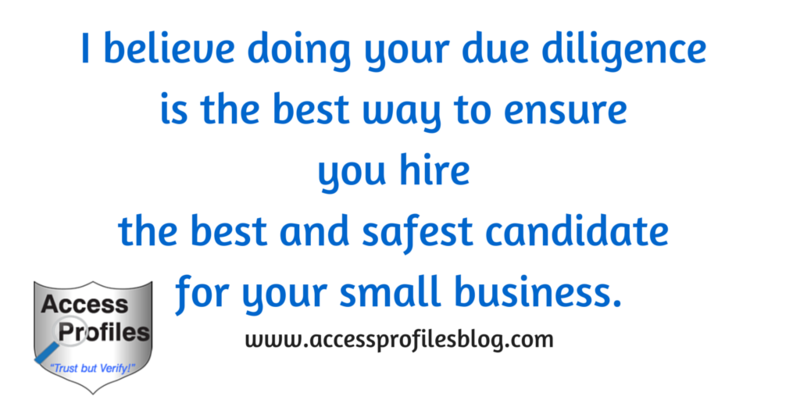 There should never be any confusion about how and why you are using background checks in your hiring practices. Going the extra mile to make sure you are completely comfortable with the entire process is the goal of every good screening service ~ and this is especially important to Small Business. With limited budgets and the settings that often result in close contact among employees and customers, hiring safely is more important than ever. 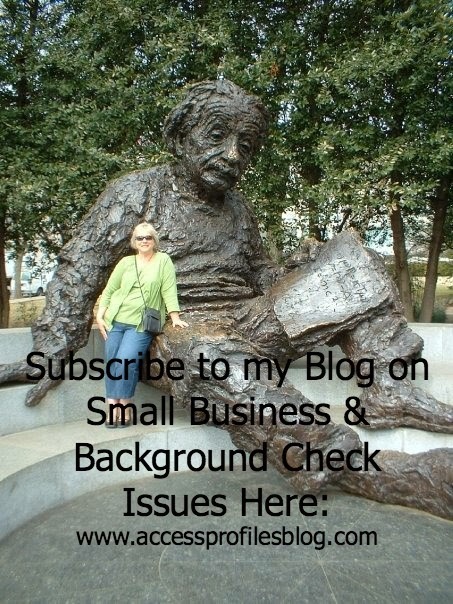 Read “4 Reasons Why Small Businesses Need to Use Background Checks” to find out more! No matter whether you are ready to make your first hire, or your 20th, preparing early for what you need to do and when makes sense. The best way to accomplish this? Partner with the right background check company first! After all, going into anything blindly is rarely the best course of action ~ and making your new hire is no exception! I can help! I would be happy to answer your questions on the best hiring practices for your small business. Email me at accessprofiles2@comcast.net . 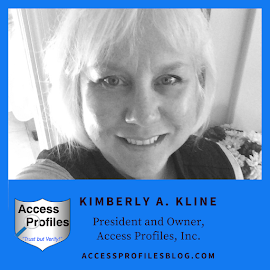 I also invite you to check out my blog at www.accessprofilesblog.com , where you will find all my contact information ~ and why not subscribe while you are there!